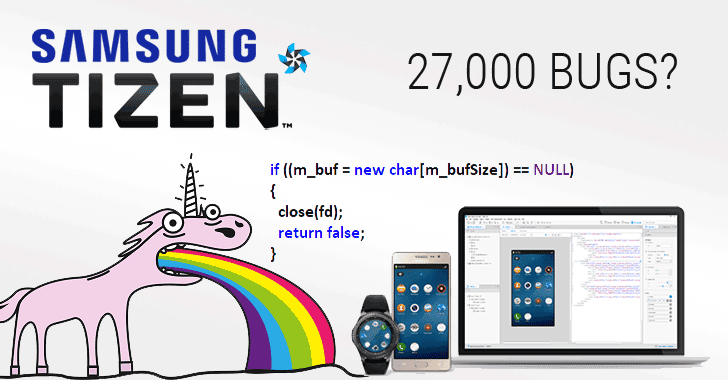 Researcher Claims Samsung's Tizen OS is Poorly Programmed; Contains 27,000 Bugs! A researcher has claimed that Samsung's Tizen operating system that runs on millions of Samsung products is so poorly programmed that it could contain nearly 27,000 programming errors, which could also lead to thousands of vulnerabilities. Tizen is a Linux-based open-source operating system backed by Intel and Samsung Electronics, which has been in development since early 2012 and designed for smartphones, tablets, smart TVs, smart watches, cameras and PCs. According to Andrey Karpov — founder of Russia-based company Program Verification Systems that made PVS-Studio, a static code analyzer tool that helps programmers to find and fix bugs in their source codes — his team has discovered hundreds of errors in Tizen project using PVS-Studio. Samsung's Tizen operating system, written in C/C++ programming language, currently has 72.5 million lines of source code, out of which Karpov's team has analysed some randomly chosen modules i.e. 3.3% of the entire Project and found nearly 900 errors. "If we extrapolate the results, we will see that our team is able to detect and fix about 27000 errors in Tizen," Karpov says. In April this year, Israeli researcher Amihai Neiderman called Tizen "the worst code I've ever seen" after he examined the operating system and discovered as many as 40 zero-day vulnerabilities in Tizen code. After finding almost a thousand bugs in Tizen code, Karpov contacted Samsung to pitch for the sale of static analyser PVS-Studio software, but Youil Kim from Samsung declined the offer. According to a mail exchanged between Karpov and Kim, Samsung is already using the SVACE technology (Security Vulnerabilities and Critical Errors Detector) to detect potential vulnerabilities and errors in source code of applications created for Tizen. "We are already aware that another tool can find additional defects. However, we don't agree with that Tizen has 27,000 defects that should be fixed. As you know, many of static analysis warnings are often considered as insignificant issues," Kim added. Tizen operating system already runs on nearly 30 million Smart TVs, Galaxy Gear-branded watches Smart TVs, cameras, home appliances and some of its smartphones sold in countries like Russia, India and Bangladesh. Samsung has even plans to have some 10 Million Tizen smartphones in the market at the end of this year. So, if claims made by the researcher are true — which was also acknowledged by a Samsung representative to some extent — the company should shift their focus mainly towards the security of the operating system in Tizen 4.0, which is due for release in September.